Richard's book is a conventional autobiography, moving chronologically from childhood in India through his years in the Colonial Service and various posts in the Diplomatic Service to a nostalgic return to India to his father's church (now a cathedral). He explains the title of his book in the first chapter. Uganda naturally takes up a large part of the book. 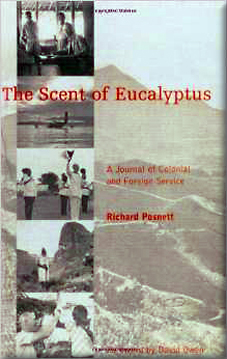 All is eminently readable, but the fifty or so pages covering Richard's return to Uganda in 1979 are an absolute must. David Owen knew what he was doing when he chose Richard to go back and make contact with his old friends who were attempting to overthrow Idi Admin. He seized the opportunity and was on his way within 36 hours. The rest reads like a Frederick Forsyth novel and shows how useful 'colonial retreads' can be when posted back to their old territories. (Sadly, the 'Heaven born' had always taken the opposite view). Before returning to Uganda, Richard had spent four years in New York with the UK delegation to the UN, followed by a stint in the FCO as Head of the West Indian Department, after which he had been appointed Governor of Belize. After Uganda, he retired from the Diplomatic Service, but was recalled to be Governor of Bermuda. He sums up his views on colonialism in a chapter called 'The New Romans', with which I heartily agree.